When we tell you that things got a little wild at Jess and Des’s wedding, we don’t say it lightly. A couple who opted for a £casual and fairly quick ceremony so that they could £get into party mode with their friends and family, Jess and Des wanted their wedding to be, simply put, a big party with heaps of awesome vendors (like We Play Records)…and, man, is that what they got. £The dance floor was pretty crazy and I would say we spent the most time there. At one point I was wearing my dad’s hat, Des was doing the worm on the ground and I was riding his back to the Pony song. I ended up leaving the reception forgetting my shoes, overnight bag, veil, bouquet (which I wanted to hang dry), and my chiffon top and silk belt which was part of my outfit earlier on (these were never to be found!). We also forgot to eat so Des did a 2am McDonald’s run from our hotel. But it was all worth it, explains Jess, who (despite losing a piece of her beloved dress) rocked a to die for A La Robe ensemble. 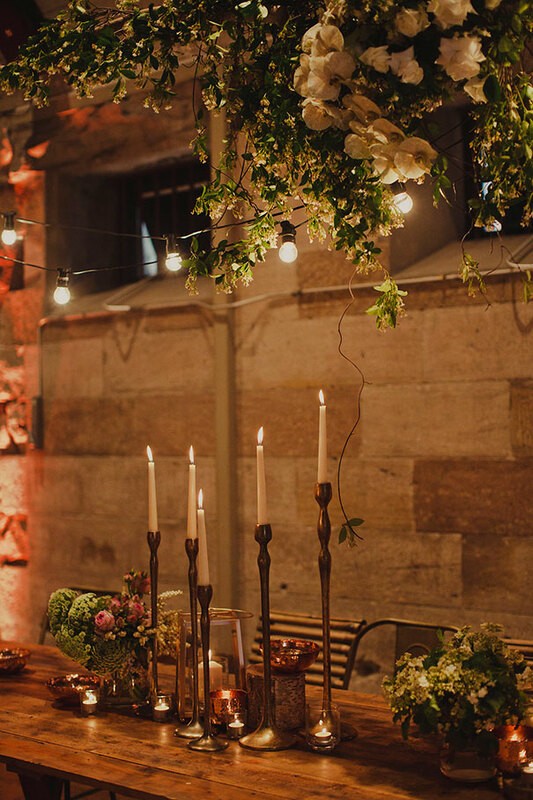 Jess and Des’s elegant and romantic celebration of love was originally featured in Issue 16, on sale now. Shop online with Mag Nation or through the HM online store here. CREDITS Photos Dan O’Day Photography // Event planner / Stylist and florist She Designs // Florist The Floral Decorator // Printer Morgan Printing // Ceremony and reception National Art School, NSW // Catering One Pot Catering // Food trucks / carts Classic Treats // Photo booth Photo Corner // Signage Sammy & Lola // Entertainment We Play Records // Celebrant Catherine Coulson // Engagement ring Goldenet // Brides wedding band Gabriela Artigas // Grooms wedding band Angus & Coote // Bridal gown designer A La Robe // Bridal Boutique and veil Hope x Page // Shoes Jimmy Choo // Accessories Country Road // Hair Marli Rose // Makeup Stefanie Pratico // Suit Saba // Shirt TM Lewin // Tie / Bow tie Scotch & Soda // Shoes Aquila // Flower girl outfit Zimmermann.